Signing the paperwork to transfer ownership of 80 acres Department of Energy property to Southern Ohio Diversification (SODI) are from left, Robert Edwards, Portsmouth, Paducah Project Office; Anne Marie White, Assistant Secretary for the Office of Environmental Management; Steve Shepherd, Director of SODI; back from left: SODI counsel Kevin Shoemaker, Joel Bradburne, deputy manager, Portsmouth, Paducah Project Office; and Greg Simonton, strategic planning, DOE Portsmouth site. With little, if any, mention of any the controversies swirling around the site, officials of the federal Department of Energy and Fluor BWXT, along with various local officials gathered Friday morning at the Portsmouth Gaseous Diffusion Plant – a.k.a. 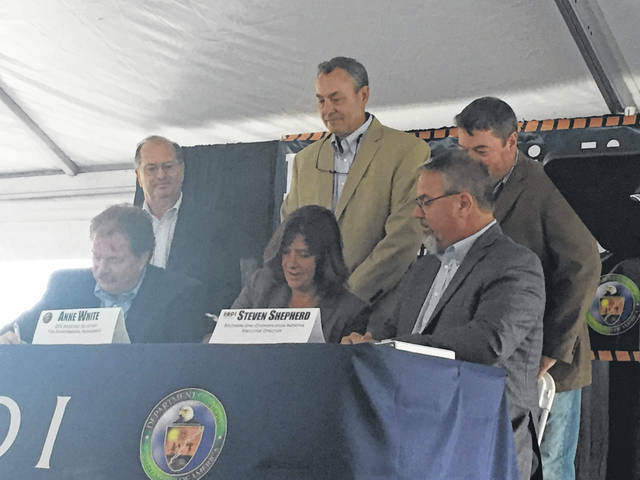 the Piketon A-plant – to celebrate what was termed a major milestone in the redevelopment of the defunct uranium enrichment plant sitting on 3,700 acres in Pike County. SODI is formally what is known as a Community Reuse Organization (CRO) for the former diffusion plant site. The group will oversee the reuse of the 80 acres released by DOE on Friday but also ultimately the entire plant site once demolition and decontamination work being completed by contractors Flour BWXT is complete. On Friday, various officials lauded the release of the first 80 acres of former plant land as a huge step in the right direction. “We did it,” said Robert Edwards, manager of the Portsmouth/Paducah Project Office for DOE. “It’s been a long process.” He added that process was not a simple one but one with lots of moving parts. SODI Vice-President Dan Minter agreed saying past prospects couldn’t wait for the 80 acres to become available, that they had to act when it was right for them to act from a business standpoint. As did others, Minter talked a lot about the advantages of the site to include, but not limited to, a ready infrastructure boasting high-capacity sewers, rail lines and especially huge electrical power availability. Minter stated he is convinced SODI can overcome any negative publicity or bad reputation clouding the A-plant site. In April, SODI and other parties involved, held an open house in Portsmouth highlighting the upcoming property transfer. At that time, officials spotlighted a 15-month study completed by Ohio University regarding how the land should be used. Perhaps somewhat surprisingly, the number one scenario picked by the public was a nuclear power plant, a potential scheme which earned 495 of 1,141 public votes cast during the OU study, which included persons from four counties: Pike, Scioto, Ross and Jackson. OU’s Stephen Howe said the diffusion plant was a longtime, integral part of the local community. “People have become comfortable with the idea of nuclear power,” he added. Regarding the 80 acres now available, the most likely use talked about in April seemed to be some sort of non-nuclear power plant, according to plans presented by OU and SODI. How long will it take for the plans for the power plant or whatever concept is ultimately adopted for the 80 acres to appear? Think in years, Shepherd explained in April. The biggest controversy at the plant site is easily plans for what DOE and Flour BWXT refer to as an on-site waste disposal facility and what detractors call a radioactive waste dump. SODI’s Minter said he was not initially in favor of the facility. However, he noted, as have others, the plant site is dotted with old, long closed landfills. One idea behind the on-site disposal facility is to move materials from the existing landfills into the new disposal site, eliminating the existing landfills and creating more usable land at the plant site. The facility also will house debris from the enrichment plant’s many over-sized buildings. Numerous local municipalities, including Portsmouth and the Village of Piketon, have passed resolutions opposing the disposal site. Piketon Mayor Billy Spencer is becoming one of DOE’s most vocal critics. For months, Spencer has been battling DOE over a Freedom of Information Act request he said the village filed roughly three months ago. Spencer contends DOE, perhaps illegally, spent millions of dollars on design work for the disposal site prior to it being formally approved. With that and other factors in mind, he and other disposal site opponents have been lobbying for the reopening of the record of decision (ROD) which cleared the way for construction of the disposal facility. “Clearly, the DOE and the contractor were motivated to steer a public process that resulted in on-site disposal. That means, unquestionably, the public process was tainted,” Spencer wrote in a letter to Anne Marie White, the assistant secretary of energy for environmental management, DOE. The public process Spencer referred to presumably was a period DOE spent gathering public input on the waste disposal plan prior to approval of the ROD. A DOE spokesperson has stated the only way to stop construction of the waste disposal site is to reopen the ROD. That same spokesperson has repeatedly said that is highly unlikely to happen. The letter to White was signed by Spencer and six members of Piketon Village Council. White attended Friday’s ceremony at the Piketon plant, praising the efforts that went into turning land over to SODI. At Spencer’s request, she later met privately with him and other Piketon officials. “She said she is going to look at things,” said Village Councilman Dennis Foreman, who was part of the meeting with White. https://www.portsmouth-dailytimes.com/wp-content/uploads/sites/28/2018/07/web1_IMG_2631.jpgSigning the paperwork to transfer ownership of 80 acres Department of Energy property to Southern Ohio Diversification (SODI) are from left, Robert Edwards, Portsmouth, Paducah Project Office; Anne Marie White, Assistant Secretary for the Office of Environmental Management; Steve Shepherd, Director of SODI; back from left: SODI counsel Kevin Shoemaker, Joel Bradburne, deputy manager, Portsmouth, Paducah Project Office; and Greg Simonton, strategic planning, DOE Portsmouth site.